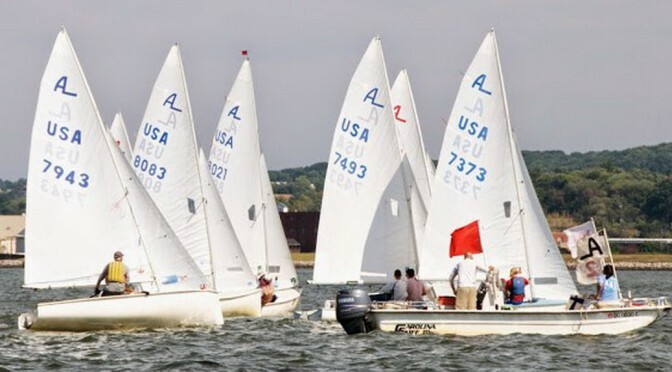 Sunday turned out to be another predictable day sailing on the Potomac. You were completely assured that whatever breeze you were currently sailing in would quickly increase or decrease in velocity, or completely change direction. Once again, our PRO and RC for the weekend (Dan, Barney, Lee, and Jim) deserve praise for focusing on running races in the dynamic wind conditions. Overall, I would describe the conditions as light and shifty were the puffs often brought wind from other directions. The south running current was quite strong and was particularly a factor as the breeze decreased. My goals for the day were to be on the line, maintain boat speed, play the shifts, and look for breeze upwind. During the first race the windward mark was set roughly due south. As we rounded the windward mark the wind died and I attempted to gain separation by moving to the edge of the fleet to maintain speed and remove myself from any wind shadows. Looking up river we could see the breeze building so we transitioned from downwind to upwind gears. We did our best to resist pinching and keep the boat moving. We were one of the first boats to get the breeze, but were on the wrong side of the coarse (we received the header, while Jim rode a lift to the mark). After the first race, RC set the windward mark off the airport shoreline approximately from the northwest. Although we won the start with Jeff, a huge header on the left side of the course meant that the rest of the fleet rode the lift on the right side of the course. Once we rounded the windward mark, we set the boat up to sail high and to windward of the mark for a couple reasons. We wanted to have inside room at the mark rounding, keep our speed up by sailing higher, and let the current carry us downwind to the leeward mark. Although not racing the buccaneers per say, this really paid off in the third race when Jeff sailed low to the leeward mark and then had to fight upwind and against the current to round the mark. The start was crucial for the third race. During the start sequence, with the windward mark still set to the northwest, the wind shifted to the north and a number of boats from various fleets were stuck well below the line, fighting the current and wind direction to make the start. With few boats on the line, we basically tried to sail fast and tack on the big shifts. Again, on the leeward legs we sailed high to maintain speed and position. The strongest wind of the day seemed to be the sail back to the marina. We sure did miss the majority of the lightning fleet! In your honor, no one could bring themselves to light the charcoal (I guess we know who brings the party). It was great to have so many new boat owners on the water (Mike C, Allen G, Anne T, and Katherine M). Hopefully this was a glimpse of what we hope to accomplish with our annual Rookie Regatta!